Camelsdale is now effectively part of Haslemere in Surrey, but was in the parish of Fernhurst until 1938 (VCH 4 p58) and is still in the diocese of Chichester. A chapel of ease was erected here in 1906 (ibid) and it has been presumed that this was what is now the hall, adjacent to the present church. It is in a style influenced by the Arts and Crafts movement and built of brick and render and with sloping buttresses. 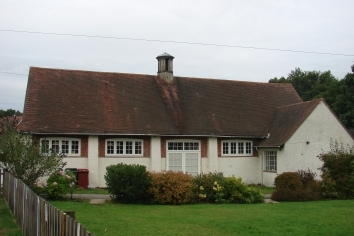 However, Howard Richter (Personal communication) has identified two structures on the Ordnance Survey map of 1912, one the present hall and the other identified as a chapel and on the site of the present church. Nothing is known of its appearance. 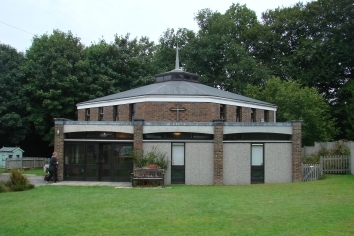 The present church dates from 1971 and was designed by A F Coombes (ICBS) on a diamond-shaped plan with the four corners cut off to form an irregular octagon. The long walls contain tall, narrow windows with a lower flat-roofed structure to the west for the vestry and entrance. The main building has a copper-clad roof, sloping up to a lantern in the centre bearing a spike. Inside, there is seating around three sides, facing the altar against the short east wall, showing the characteristic Anglican reluctance to accept a central altar even where the plan seems made for it. However, the general effect is pleasing with white-painted walls and exposed roof girders. Some of the simple fittings are from the previous church.